A key task for every Program Manager is the management of stakeholders. Engaging with the right people in the right way may be the difference between success and failure. When you are initiating any project or program and designing your communication plan, I find it a good idea to draw up a Stakeholder Map. Even if you don’t yet know who all your stakeholders are, it provides a simple framework for defining the different types of communication you might need. So What Exactly Is a Stakeholder? A stakeholder is simply anyone with an interest in your program. This may be individuals or organisations. It is your job as the program manager (along with your team) to identify the stakeholders and manage their requirements, expectations, and their influence to ensure a successful program. Examples of stakeholders include the technicians working on the program, senior executive management, suppliers, and customers, amongst others. A stakeholder map provides us with a means to group stakeholders together so we can think about managing them as groups rather than individuals. This is very important in a large program where they will be hundreds of even thousands of people involved in or interested in the program, so that you as the program manager, don’t get bogged down with day-to-day stakeholder management during the execution of the program. A Stakeholder Map has two axis. On the horizontal we have “Interest”, representing the level of interest an individual has in the program. This will typically be a function of how the program will impact them or their organisation, or how much input into the program they will have. 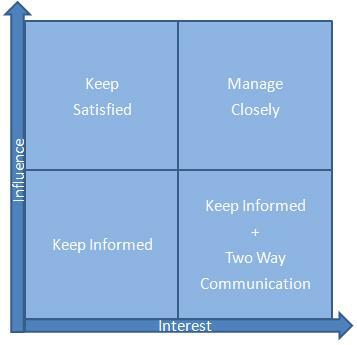 On the vertical axis we have “Influence”, representing the level of influence or power an individual has in shaping the program and its direction. Obviously, you will want to engage these people fully and manage your relationship with them carefully. You may want to keep them included in the general program communications which go to everyone, but additionally you may want to distribute more focussed communications specifically for them, or even meet with them regularly, individually or as a group. These are people who could exert a large amount of influence over your program, but don’t have a direct interest in the program execution or its benefits. These are people you may need to draw on to get things done in spheres outside of your immediate control, so in addition to the regular program communications, you may want to devote specific time to this group to keep them on-side, making it easier to gain their support later if you require their help. Typically, this group involves the people working on the detailed execution of the program, such as technicians and software developers. Despite the fact that this group can’t exert huge influence over the program direction, they can exert huge influence over achieving the schedule. You should keep this group motivated with regular communications, and also take time to collect feedback from this group, so you can tailor your communications and make alterations to the program as you go. The traditional Stakeholder Map as drawn in most Project Management books identifies this category as “Keep Informed”, but I think you need to do more, as this group is vital to the successful execution of the program, which is why I have also added “Two Way Communication” as well as “Keep Informed”. These are people who simply need to be kept informed as to the program status, as they are neither that influential or that interested in the program’s execution of benefits. 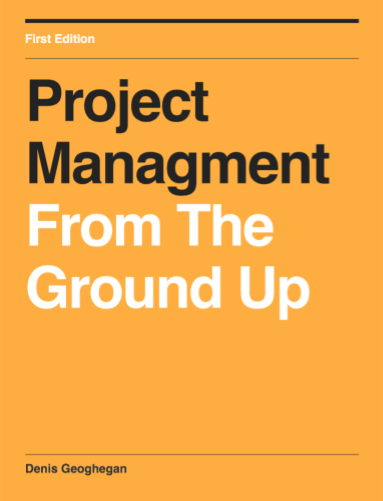 Project management books typically show an example of mapping individuals to the map, but in a large program this is impossible as so many people are involved, so you may want to keep a spreadsheet to map individuals to one of the four categories above. As you can see, A Stakeholder Map makes it easier to define the types of communication you might need during your program, and gets you thinking about how to manage your relationship with various stakeholders early in the program, helping you to start on the right foot when managing stakeholders.